The Companion Chronicles have become of late, spring boards for new series such as Jago and Litefoot, or a way to explore concepts only hinted at in previous audios. The Sentinels of the New Dawn is one of these. Conceived as a prequel to the Sixth Doctor lost story Leviathan, it's written by the same writer Brian Finch, using the opportunity to flesh ideas hinted at in Leviathan and offering the tantalising possibility of further stories to come. For an audio intending to expand on ideas touched upon in a previous story, The Sentinels of the New Dawn is a rather 'by the numbers' affair. It does a terrific job of authentically recreating a Third Doctor story with an earth bound adventure filled with numerous chase sequences, Venusian aikido and the Doctor flying a helicopter, but it feels too standard for the Companion Chronicles which have become a great forum to further explore the ideas raised in Doctor Who. But that is not to say it is a bad story. It is thoroughly engaging and Caroline John gives a marvellous delivery, with great interaction from Duncan Wibsey playing the various supporting characters. There are some lovely moments such as Liz expressing her regret at leaving the Doctor so soon, though it sadly only comes from hindsight. Exploring this idea more dramatically and allowing the Doctor’s own opinion of Liz’s departure to be heard would have been a rather interesting idea to explore, something very much in keeping with the Chronicles themselves. In the end, the play shows itself to be a set up for a greater plot arc in future releases, a bit too readily. 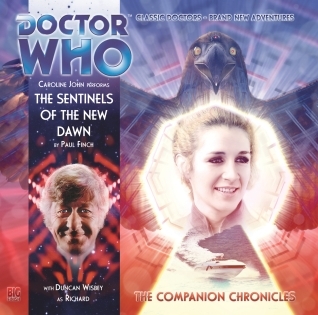 Although there are enough ideas in this story to entice listeners to hear more about the New Dawn, this Companion Chronicle, although enjoyable, comes across as merely the stepping stone for something far more intriguing.